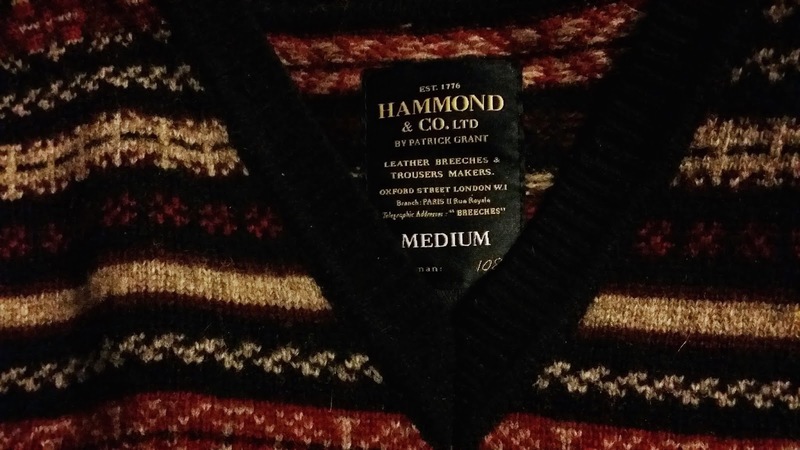 Then there’s my Hammond & Co. blue and red Fair Isle. This was acquired from Debenhams as part of the Patrick Grant collection. A bargain purchase in the sale at £20. 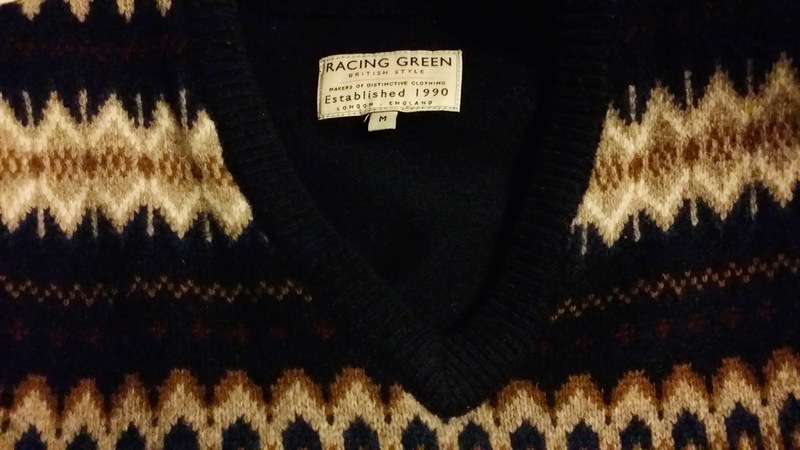 The third one is a knit by Racing Green, which I also found at Debenhams. 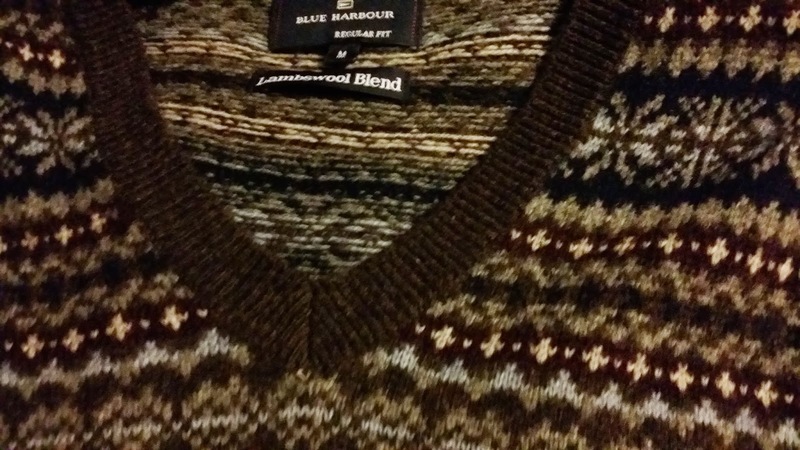 Adding to the grandfather chic is a brown and blue slipover from M&S as part of their Blue Harbour range. 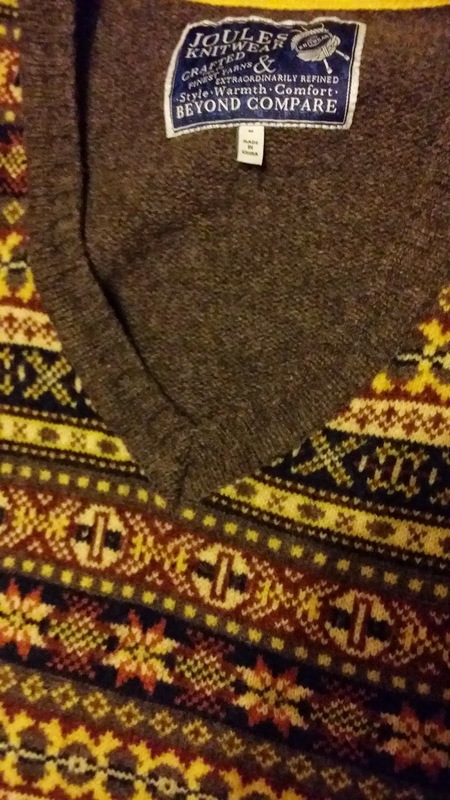 Made from a lambswool blend, it is super soft. My latest addition, purchased via Messrs E & Bay is this war time muddy brown effort with a rather marvellous yellow to set it off. Rather than being constructed on the Shetland Islands like all true Fair Isles, this Joules effort is ‘made in China’. However, it still ranks highly in my books regardless of provenance. In fact, I do believe this is my favourite. Here it is being worn by your favourite protagonist. Which one do you prefer? You may have noticed that I have sprouted hair again on my face, but rather than a lip weasel, it has now been coined a ‘chin badger’. What is more, it has been cultivated with the full approval of my beloved. I believe I have all the necessary paperwork. Top hole garmentry, my dear fellow! I would have to say for me the favourite is a dead heat between Darcy's offering and the M&S one. Oh how I have hankered after the former, and very nearly bought the latter but decided to wait 'til the sales - at which point they'd sold out of my size, blast it! The only thing I find is that one has to be careful with some Fair Isles as a few patterns/colours look a little too 1970s for my tastes, but by and large I am with you all the way on being a winter wardrobe must. In fact, guess what I'm wearing as I type this...? Yes, one of my own Fair Isles! I would argue that I have six, although at least a couple of them could be open to interpretation (and are long-sleeved). They have been obtained from various and perhaps surprisingly modern concerns - Uniqlo, a Ralph Lauren by way of TK Maxx and a Yankee company called Jos. A. Bank. 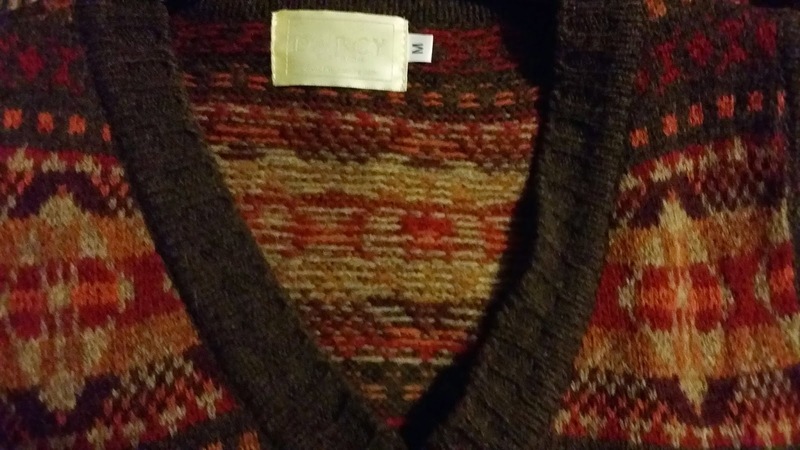 Plus mother has knitted me a couple in a jolly clever wool called "Magic Yarn", which is pre-dyed in a certain pattern such that it creates a fair-isle effect as one knits it up - so good one can barely tell the difference. Nevertheless she has steeled herself and promised to make me a "proper" one to add to my ever-growing collection.